My embedded form has English month names in the date item. How can it be localized? 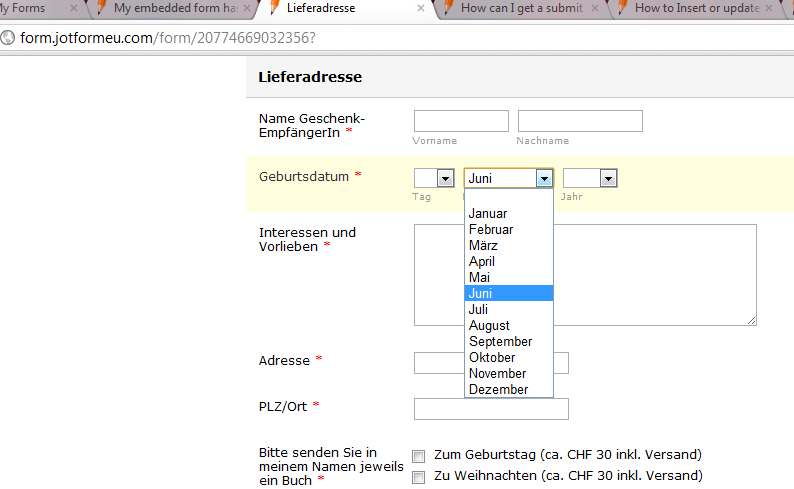 when creating the form on german.jotform.com, the names are in german. but when embedded, they appear in english. I have not heard back from you since our last chat converstion, but the solution I gave seems to have fixed your problem. With that in mind, I am closing this thread and marking your issue as solved. Feel free to open a new thread if you have other questions. Thank you for using JotForm! Somehow the chat was gone... couldn't get it back. Yes, the problem was fixed. Thanks a lot!! In behalf of my colleague Neil, you're welcome! If you need our assistance again, please don't hesitate to contact us anytime. any other way to fix this? Did you re-embed the form after making the changes? . When you use the iFrame method, everytime you make a change , you should re-embed the form into your page and remove the old one. It simply stops to work after some time. I tried to re-embed (made a change just for the change's purpose), but still the months are shown in English. The same happens in Preview on Jotform.com. Here you can open the form directly: http://form.jotformeu.com/form/20774669032356? Please try clearing your browser cache as well. Please update us if the issue persist.